Home » Posts Tagged "sweet WordPress themes"
The following article comprises of various Cute WordPress Themes for making any Company Websites. This world is of equality and independence. Every individual no matter what the gender whether male or female has the right to live their life freely and respectfully. Same things are implemented and are considered while dealing with the creation of Websites. It is not the male dominant world today where the website of any company or a venture is meant only for men or to be designed by men. The modern world has facilitated everything to the women as well for their welfare and development. It is to be kept in mind that an approach of any woman towards building a website is different from men and hence the choices of her selections should also be something to be taken care of. Any feminine website often consists of color splashes making it pleasing for the user. The arrangement of the content also can be seen very well managed in a website designed by a female as compared to a male designer. The company can be of any type but being managed by a girl, the website of the same is designed keeping thorough detailing towards the looks and styling. Hence to achieve the same, some of the unique and Cute WordPress themes can prove to be the best options for creating a girlie website. There is a wide range of such themes to choose from which are best suitable and consists of many superb features to be brought into application. Charm is the most well managed and spectacular Cute WordPress template for any company website. The detailing has been carried out knowing the current scenario and the choice of the user. Therefore it has been loaded up with the most promising features and the color schemes to provide a divine feel and make the user spellbound with what it offers. It is a very polished theme with more than 580 font icons and hence derives a medium for creating a thought and desired content filled website. The interface of this theme is very lively and flexible which makes it excellent and most widely usable. SKT Lens Pro is a wide-spanning and intuitive, demanding and responsive cute WordPress theme that is Cute in nature. It has been crafted for the most delightful experience but also comes up loaded with many exciting features. To make it more versatile and advanced it has been given the functionality to perform on any device. The header, footer and the sidebars are so arranged that one can just put in the desired content without any issue and can change the layout of the interface anytime with multiple options to choose from. It also propounds the number of color options to enhance the overall look of website as well as the content. This is one of the type of Cute WordPress Themes which can be used for other multiple purposes as well. It is Google mobile friendly and cross device responsive theme. It has been tested with popular plugins like WooCommerce for eCommerce. It comes up with the shortcodes available built in and other shortcodes can further be added using plugins. It has more than 580 font based icon pack available and has lots of widgets available in sidebar and footer. It consists of default slider with 12 animation effects and pause time control is also available. It has been tested with qTranslate X for multilingual and with Nextgen Gallery for photography and portfolio set up. This is a Cute WordPress template which is responsive and can be used for gardeners, pools, lawn care services, landscapers to have their portfolio and services website and other types of websites. This theme is multi-concept due to the multiple features present. It is full color changing and images and text can be easily changed. One can use it for construction, renovation, cleaning and other concrete and commercial websites as well. This theme is compatible with a lot of plugins and the scalability and flexibility of this theme is very easy. One can have the best of this theme in built functions plus add any type of plugin to extend the use of the theme to their website. It has 5 level deep drop downs and it is fully compatible with Elementor Page builder with 27 different widgets. Girlie is a feminine and one of the type of Cute WordPress themes made for those independent girls and women who want to have their own personal website. It is a responsive theme for both tablet and mobile view as well as web. It has passed the test of being Google mobile friendly. It consists of the power packed theme options to help you change text color, size and font as well as manage contact email and info. It also contains the shortcodes to easily power up your website with accordions, testimonial sliders, call to action buttons or welcome or info boxes. Social media integration is also included in this theme which is a must for the websites nowadays. The home page has various animated sections which can link with the inner pages of the site and can also present its crux. It is a responsive Cute WordPress theme and template which has been tested for all devices as well as for cross browser and cross device compatibility. This theme has also undergone Google mobile friendly test as well. It has the homepage content which is easily manageable via default sections which can have their own appearance with fonts, color, background color etc. This theme is WooCommerce compatible which makes it easy to set up a cake shop and pastry shop for online selling. It has 650+ Google font integrations for helping you suit the best font you like for your website. Cyrillic and latin sub sets also have been included to facilitate the use of custom languages. Panaroma PRO is a type of Cute WordPress Themes which has been made to showcase 5 most important things that matter the most to your website. It is a photographer WordPress theme and has very unique features which make this theme at par with the others. One has the control to change the background image and set up a default background image as well as can have different background image for each page. This theme is compatible with latest version of WordPress and has been coded with HTML5 and CSS3. Diet and Nutrition WordPress theme has been coded for dietician and nutritionist and pediatrician and other similar field websites. However it can be used for other website purposes as well. Its homepage is built upon easy to use sections which can be replicated to use at least 20 sections to have a lengthy homepage if one needs for landing page It has over 580 font awesome icons integrated and more than 650 Google fonts to choose from. It has default slider control option and tested with external slider plugins. 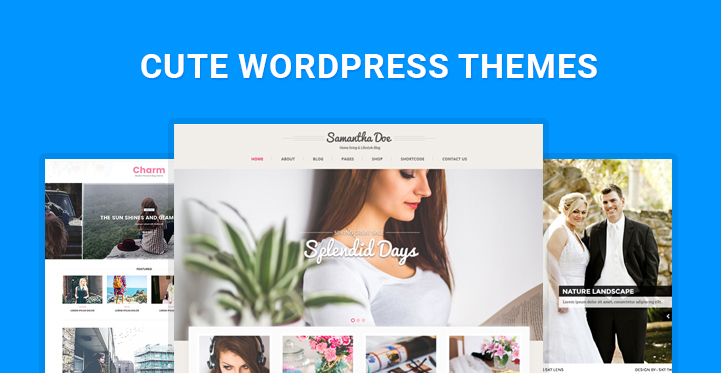 This entry was posted in wordpress themes and tagged sweet WordPress themes on February 21, 2019 by SKT Themes.